Chinese double entry business visa for the 7 working days processing. (Valid for up to 3 months and a stay of up to 30 days, a visa of reduced validity will be provided to cover the necessary time in China, at the consulates discretion and depending on supporting documents provided on application). Processing days do not include postage time and day of receipt. Therefore, please consider this in your application time. Applications cannot be processed more than 3 months in advance of the entry date. There must be at least 6 months validity on your passport from the expiry date of the visa. There must be two free adjacent pages in your passport. 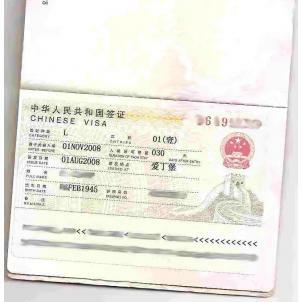 Chinese double entry business visa for the 7 working days processing.